Blindness due to a bacterial infection that causes trachoma is a serious problem worldwide. The currently recommended number of rounds of mass drug administration may not be enough to ensure elimination of the disease. Trachoma is a disease of the eye and is the most important infectious cause of blindness worldwide. 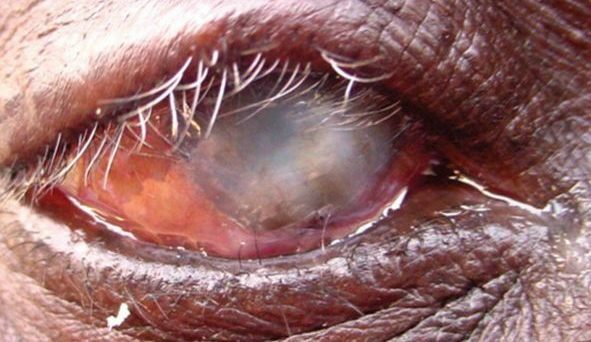 The bacterium Chlamydia trachomatis is responsible for the pathology- which includes eyelid scarring. After repeated exposure, the eyelid can become so scarred that it turns inwards and causes eyelashes to rub against the eyelid. This can scar the cornea and results in pain and light intolerance. If left untreated, infections can lead to vision impairment and even blindness. Trachoma is spread either through direct contact with eye or nose discharge from infected people or through indirect contact, facilitated by flies that have contacted the eyes and noses of infected individuals. The bacterium is endemic in many countries across the globe, but in 1996 the WHO Alliance for Global Elimination of Trachoma (GET2020) set a goal to eradicate blindness caused by repeated infection by 2020. Elimination of trachoma depends on the SAFE strategy, which covers four types of interventions: surgery (S), antibiotics (A), facial cleanliness (F) and environmental improvement (E). While all of these interventions are essential for elimination, mass drug administration (MDA) with azithromycin is the cornerstone of control. Drugs are administered at a community level in conjunction with national control programs. Dosage is determined by a dose pole and length of treatment in a given community is determined by the baseline prevalence in the district. Currently, the WHO recommends annual treatment of all individuals within an affected community for at least 3 years if the prevalence of clinical signs (trachomatous inflammation-follicular) is between 10-30% or 5 years if the prevalence of clinical signs is >30% in individuals under 10 years of age. MDA programmes often target children, as they are easier to treat en masse. Fortunately, modelling results show that treatment of children only is an effective strategy to reduce, and even eliminate, trachoma at the population level. Although termed elimination, the goal of the control strategy is to reduce prevalence to less than 5% among 1-9 year olds, thereby reducing the force of infection. It is estimated that 100 repeated exposures are required before an individual becomes blind, so reducing transmission will greatly reduce probability of becoming blind. Although 2020 is the target for elimination globally, 182 million people live in trachoma endemic regions. 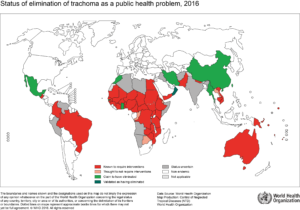 Only three countries have been confirmed to have eliminated trachoma by WHO, with another seven claiming elimination. With so few countries meeting elimination targets, how effective have MDA programmes been and is there a risk of stopping them too early? Azithromycin is effective at clearing individual infections, but mounting evidence suggests there are barriers to its effectiveness at a population level. In areas that are considered to have moderate endemicity (~20%), three annual MDAs do not seem to be enough for local elimination. Three MDA rounds did not provide sustained elimination three years after treatment stopped in an area where baseline was 30% prevalence. In hyperendemic areas (>50% baseline), seven to ten rounds of MDAs may be needed before conducting a follow-up survey. These findings point to a reevaluation of the current recommendation for length of MDAs. Current policy for MDA treatment rounds doesn’t seem sufficient, especially in high endemicity areas. In concert with MDA, addressing hygiene and environmental risk factors in communities is essential for trachoma control. In regions where the endemic equilibrium is high, it is likely even more important to employ multiple strategies for reducing transmission. Controlling trachoma requires improving facial hygiene, awareness of the disease and improved sanitation. In addition, insecticide control of flies can be more effective in reducing trachoma than simply providing latrines, emphasizing the role of vectors in the spread of this pathogen. Moving forward, it will be important to monitor areas where MDA has ceased, to ensure that there is no resurgence of cases. In districts where MDA is ongoing, control programs can integrate with other MDAs to reduce costs and treatment fatigue in communities. In settings where trachoma was above 20%, even 30%, it will be essential to extend MDA programs and integrate water, sanitation and hygiene (WASH) interventions into control programs.